After a day's break following the UK Nationals, the International Moth World Championship began today. 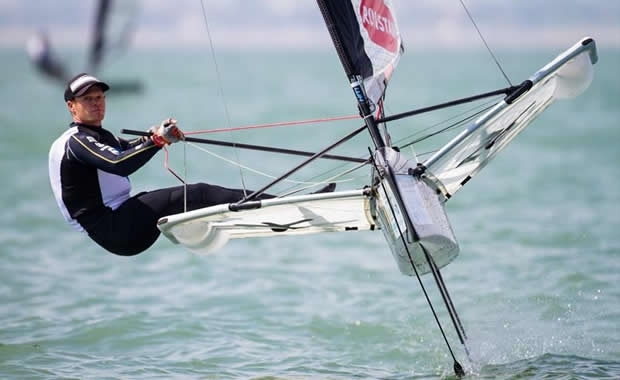 With a record-breaking 138 sailors from 18 countries are taking part in the event, the fleet is split into two groups of 69 boats. The thunderstorms which have been plaguing the UK in recent days led to a two hour postponement ashore. The sailors were released at midday with the first race started in 13 knots of wind at 13.15 BST. Course setting was made very tricky with the wind swinging through around 90° and ranging from 3 to 14 knots. Getting races away was proving nearly impossible, but still Yellow fleet have managed two races and Blue fleet have sailed one. A second race was started for Blue fleet, but no-one had reached the windward mark within the 20 minute time limit. The same happened for Yellow fleet's third race. Of the favourites, Nathan Outteridge (AUS) missed race 1 due to gear failure on his way to the start and had to go in for repairs. He managed to get out just in time for the second Yellow fleet race and skilfully sailed his way through the fleet to finish third. Hiroki Goto from Japan put in an excellent performance to finish 4th in Blue fleet's only race. Current leader overall is Chris Rashley (GBR) who finished with a 1st and 2nd in Yellow fleet's two races. The leader board is of course biased as Blue fleet have only completed the one race. Rob Gough (AUS) won Blue fleet's only race and Robert Greenhalgh won Yellow fleet's second race. The fleet returned to shore at 16.15 in a dying breeze with just the three races completed between the 2 flights. No sooner had they crossed West Pole Sands, a lovely force 4 filled in. The helms were held on the beach with the possibility of going back out to the racecourse, but there just wasn't enough time to get the racing restarted.